The horrific bombing of the Boston Marathon, to hear the FBI and the Boston Police tell it, is solved: One bomber, Tamerlan Tsarnaev, is dead, gunned down by police and then run over for good measure by his fleeing brother Dzhokhar, who was captured a day later in a citywide manhunt, after being hit by a fusillade of police bullets fired into a trailered pleasure boat he was hiding in. Among the reasons law enforcement sources are so confident they “got” their men were video surveillance photos from a Lord & Taylor storefront area showing the two brothers as they arrived at the finish-line area, each wearing a backpack, allegedly carrying what the FBI now says were two identical 6-quart steel pressure cookers marketed by the Canadian corporation Fagor. Fragments of those pots, which the FBI says were packed with black powder (gathered from a collection of fireworks) as well as nails and BBs, were recovered at the scene. 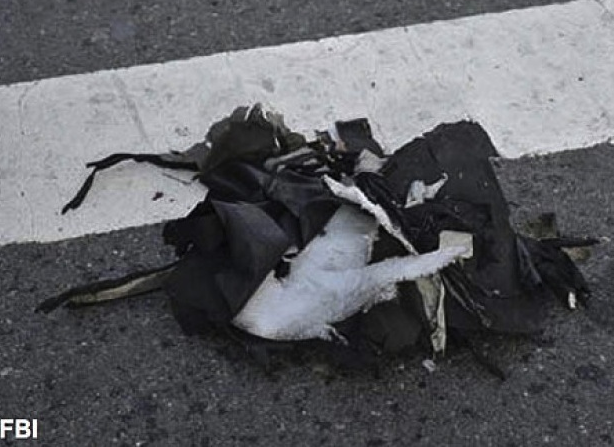 Besides the photos of the two brothers wearing their packs, the FBI also has released a photo of the remnants of one of the backpacks, allegedly the black, or dark-colored, one worn by the elder Tamerlan Tsarnaev. There is also a photo of what is described as a white backpack, which was placed on the street side of a metal crowd-control fence. It was said to contain the second bomb, which exploded 10 seconds later, further from the finish line. 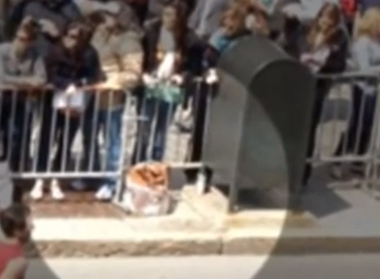 This is presumed to be the same light-colored pack Dzhokhar is seen wearing in the store video as he arrives on the scene. There are a number of serious problems with this supposedly damning evidence, however. First of all, nobody looking at the evidence to date has tried loading up one of these Fagor pots with the amount of weight that would have been created by a big four or five quarts’ worth of black powder, perhaps two quarts of nails, and perhaps a pound or two of BB shot, to see what it would look like in a basic unstructured book bag of the type the two men were wearing. WhoWhatWhy decided to do that. The first problem was buying the pot. This reporter looked it up online and found that it was being sold by Macy’s. Going to the nearest Macy’s at the Montgomery Mall in Montgomeryville, PA, we discovered that the cookware section had no pressure cookers. The store clerk in charge of that section was asked where pressure cookers were. “We don’t sell pressure cookers,” she said. 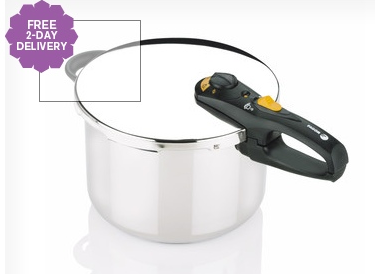 Luckily, we found several of the Fagor six-quart pots in a nearby Sears store, and purchased one, on sale for $76.00. The dimensions of the kettle are 10 inches in diameter and 7.7 inches bottom to top, not counting the handle (which cannot be detached without exposing four bolt holes through the top and side of the lid). After getting a calculation that a quart of black powder weighs about two pounds (a very general measurement, because the compound changes weight according to the humidity, and can be loosely or densely packed like any powder), and testing a bag of small nails to find that they weigh about six pounds per quart, and after weighing the pot itself, we found that the whole contraption, fully loaded with four to five quarts of powder, two quarts’ worth of nails and BBs, and a battery and ignition device, would weigh about 30 lbs. So we put a sufficient number of exercise weight plates into our container, shut the lid, and tried carrying it in two backpacks similar in construction to the ones on the two brothers’ backs. 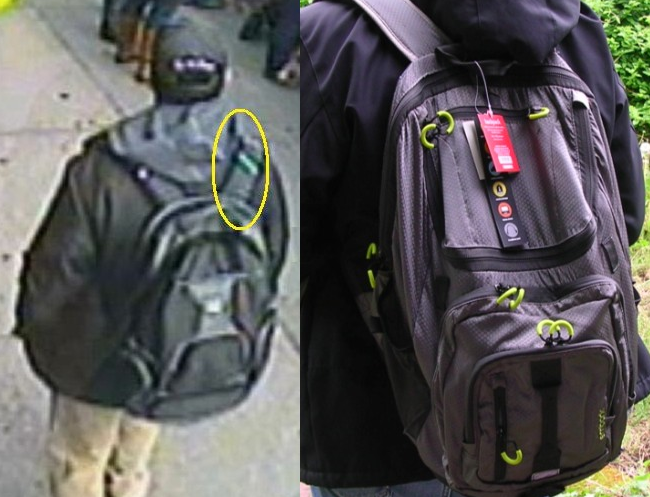 If you look carefully at the first set of photos, showing the surveillance photo of Dzhokhar Tsarnaev and the model wearing a similar pack containing the loaded pot, both packs being slung over the right shoulder using the right strap only, you can see a dramatic difference. There are stress wrinkles under the jacket of the right image on the model, caused by the 30-lb. weight pulling downward, but Dzhokhar’s jacket can be seen to be completely smooth under the strap. His pack is clearly extremely light on his shoulder (which may be why he’s not wearing it slung over both shoulders). As well, you can see that the weight of the pot, pulling down and outward in the model’s bag on the right, is causing a downward sloping of the top of the backpack, and is also causing many vertical stress lines on the face of the bag itself. Dzhokhar’s bag, however, is flat across the top, indicating no such downward pulling force, and it does not exhibit any downward wrinkles on its side. Whatever he is carrying, it is clearly not a 30-lb., or even a 20-lb. cylinder. Moving to Tamerlan Tsarnaev, check out the model’s slightly larger pack, which like Tamerlan’s is being worn with both straps over the shoulders. Again, the pack on the right, containing the loaded pot, is causing obvious wrinkles on the winter coat where the straps are bearing down on a small section of padded coat. Once again the weight of the straps of the shoulder— this time 15 lbs. per strap—can be seen causing prominent wrinkling on the winter coat worn by the model underneath the straps. The downward sloping of the face of the backpack, and also the vertical stress wrinkles are prominent and clearly visible also. In the video surveillance photo of Tamerlan, however, his coat can be seen to be unwrinkled under the straps, and there are again no vertical stress lines on the face of his pack. Again, it is hard to imagine a 30 or even a 20-lb. weight in the bottom of that pack. There are other questions too, that need to be asked, and that demand answers. 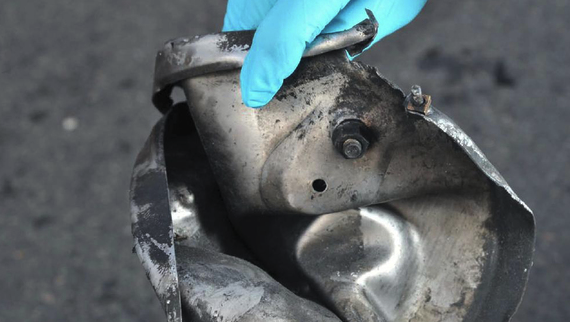 First of all, there is the matter of the photo released by the FBI of an exploded backpack, said to have contained one of the pressure cooker bombs. The material is dark black, and it is not because of charring, because the color is uniform, and also there are white images on it, including a white square (more on that later). That would have to have been Tamerlan’s pack, given that Dzhokhar’s is white or light-colored. But looking at the image of Tamerlan wearing his pack, and contrasting the light color of the pack relative to his clearly black winter coat, it appears that the pack is more of a gray than a black. It’s possible that it’s a matter of the lighting and the quality of the video, but it does not seem to be a jet black color, especially as there are much darker lines on it that appear to be real black, along the seam lines. So was that exploded pack really Tamerlan’s? As for Dzhokhar, the photo of a pack set on the sidewalk in front of a bunch of spectators, in the spot where bomb number two exploded bears no resemblance to the pack he was photographed wearing, which had wide black seam lines and zippers. Note: Stay tuned for more information on Craft, its origins, management and relationship with the US government. We will try to determine what these private “soldiers” were doing at the end point of the marathon wearing large backpacks (or mysteriously losing those large backpacks) right around the time of the explosions. Of course it’s possible there is some benign explanation. It’s equally possible they were hired to guard against some threat that runners and spectators were never cautioned about, which could explain all the secrecy now about them. Some may argue that Dzhokhar Tsarnaev has confessed to the crime, and even that two days ago his written confession was found scrawled on the inside wall of the boat he was captured in. But while the corporate media is reporting that as evidence, let’s not rush to judgment here. Those reports of a confession have been sourced by the media only to unnamed “law enforcement sources” and there have been many such leaks and statements that have turned out to be false, such as the report of a 7-Eleven being robbed by the brothers, and a lengthy shootout between Dzhokhar Tsarnaev and police before he was captured in the boat (unarmed). Since Dzhokhar has not said a word since he was finally provided with a lawyer, these “law enforcement sources” are reporting things that Dzhokhar would have had to have said during an unrelenting 16-hour interrogation by the FBI’s crack post-9/11 terrorist interrogation unit, who interrogated him while he was in serious condition from having been shot multiple times, including through the neck, possibly blowing off part of his tongue, after he had suffered massive blood loss and shock, and while he was heavily sedated and handcuffed to his bed. We’re supposed to accept that “confession” without question? The Court: I will ask the doctor whether or not the patient is alert. Dr. Odom: How are you feeling! Are you able to answer some questions? There follow a series of questions and answers between judge and attorneys, and then some questions to Tsarnaev, which are only answered by nods. The Court: Can you afford a lawyer? The Court: Let the record reflect that I believe the defendant has said “No”. This is the quality of “conversation” of which Dzhokhar was capable almost a week after his capture, at a time when the hospital was listing him in “fair” condition. Just what level of “conversation” did he likely have with his FBI interrogators in secret when he had just been captured and was listed in serious condition and when there was some question as to whether he would even survive his shooting ordeal? Meanwhile, the purported writing on the inner hull of the boat was not reported for several weeks, until CBS Senior Correspondent John Miller—himself a former FBI spokesman—broke the story. Was it really written by a frightened and severely wounded Dzhokhar Tsarnaev while he was on the lam from a city-wide manhunt? Or is it perhaps some cop’s prank? At this point who knows? As far as we know, nobody has tried to match the scrawl with his own handwriting to date. So that brings us back to those two backpacks. What could have been in them for them to be hanging so lightly on the two suspects’ backs? And if it wasn’t two explosive-laden pressure cookers—if—then who put those bombs at the finish line? These are precarious times. We owe it to ourselves to fully investigate all aspects of this singular affair, not to take anyone’s word for what we should think. There are 1598 comments Our Comment Policy: Keep it civilized, keep it relevant, keep it clear, keep it short. Please do not post links or promotional material. We reserve the right to edit and to delete comments where necessary.